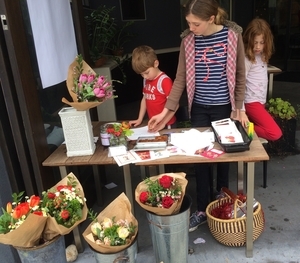 Brother & Sisters Flower Shop came into being as a concept over two years ago and continued to find legs as a popup flower shop until its brick and mortar life began this year at Grand Fare Market. Freya Prowe has been an artist and floral designer for over 20 years concentrating on weddings and events primarily with her floral business. When the Grand Fare Market space became available she and her husband Doug Washington started to conceive of a space that would accommodate both of their passions. His for food and service, and hers for flowers and art. They thought that by creating a beautiful, inviting space, filled with delicious house made food, wine, coffee, flowers and artwork a neighborhood they love would be richer and their lives would be richer as well. With an emphasis on working with only the highest quality flowers they can find, careful attention to combining colors and textures and by listening carefully to clients’ desires, Brother & Sisters Flower Shop is now buzzing inside Grand Fare Market six days a week.